These grilled chicken wings take the classic appetizer to a new level with a marinade that keeps them moist and tender. Cooking the wings on the grill adds a nice char to the skin and bit of smoke to the meat, not to mention makes them a healthier option compared to deep-frying them. These wings are full of flavor and are great when served with a creamy dipping sauce. If you want to keep it somewhat traditional, use a blue cheese sauce; however, if you are not a fan of blue cheese, then ranch dressing can work in a pinch. Combine the marinade ingredients together in a bowl or large mixing cup and mix well. Place chicken wings in a large resealable bag and pour marinade over top. Turn to coat, release air from the bag, seal well, and refrigerate for 2 to 6 hours. For blue cheese sauce, combine blue cheese, sour cream, mayonnaise, garlic, and Worcestershire cause in a bowl. Stir until smooth. Add enough milk to give the sauce the consistency of pancake batter. Season with salt and pepper. Cover and refrigerate for at least 1 to 2 hours before serving. Preheat grill for indirect cooking (heat part of the grill to hot while another is low). Remove wings from marinade and reserve marinade. Place wings over the low fire. Grill until done, about 30 to 35 minutes or when an internal temperature reaches between 165 and 175 F. Brush liberally with reserved marinade only during the first 15 minutes of cooking time. Do not use reserved marinade past that point. Discard the remaining liquid. 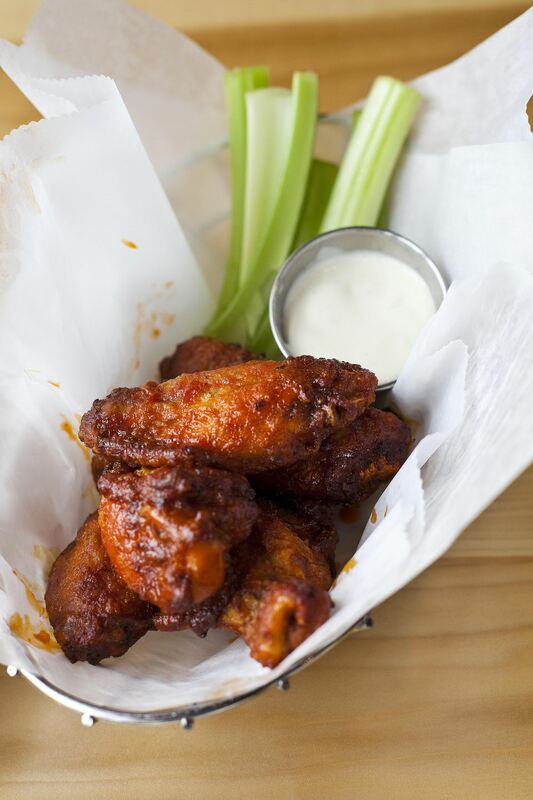 Once cooked, remove wings from heat and serve with blue cheese sauce. Break up whole chicken wings: If you have purchased chicken wings that are whole, you will need to separate the flat piece from the drummette. Using kitchen shears, first, snip off the wing tip. Then cut between the joints to separate the two parts. Find the right heat level: If you like your wings spicy, play with the marinade before putting in the raw chicken. You may want to add a little more Tabasco or perhaps a few more shakes of red pepper flakes. Once off the grill, if you find them too mild for your taste, toss them with a bit of hot sauce such as Frank's RedHot sauce. Grill using indirect heat: The reason this recipe calls for cooking over indirect heat is that the marinade ingredients are sure to cause flare-ups over a high temp. So, unless you want inedible blackened skin, make sure to set up your grill so it has a hot area and a cooler area; then only place the wings over the cooler grates when cooking.